A recent United Nations report concluded that a global shift toward a vegan diet is necessary to combat the worst effects of climate change. And the U.N. is not alone in its analysis. Researchers at the University of Chicago concluded that switching from a standard American diet to a vegan diet is more effective in the fight against climate change than switching from a standard American car to a hybrid. I was wondering if there was any scientific basis for their claims, or if there are scientific proofs about the contrary. TL;DR: Yes, a plant-based diet does use less resources than a meat-based diet. However, neither diet is currently sustainable. Cattle-rearing generates more global warming greenhouse gases, as measured in CO2 equivalent, than transportation, and smarter production methods, including improved animal diets to reduce enteric fermentation and consequent methane emissions, are urgently needed, according to a new United Nations report released today. There was a study at Cornell, published in the American Journal of Clinical Nutrition, that looked specifically at the sustainability of meat based diets vs plant based diets. They studied lacto-ovo vegetarians (who also include eggs and milk products in their diets) not vegans though. The lactoovovegetarian diet was selected for this analysis because most vegetarians are on this or some modified version of this diet. In addition, the American Heart Association reported that the lactoovovegetarian diet enables individuals to meet basic nutrient needs. Worldwide, an estimated 2 billion people live primarily on a meat-based diet, while an estimated 4 billion live primarily on a plant-based diet. The US food production system uses about 50% of the total US land area, 80% of the fresh water, and 17% of the fossil energy used in the country. The heavy dependence on fossil energy suggests that the US food system, whether meat-based or plant-based, is not sustainable. The use of land and energy resources devoted to an average meat-based diet compared with a lactoovovegetarian (plant-based) diet is analyzed in this report. In both diets, the daily quantity of calories consumed are kept constant at about 3533 kcal per person. The meat-based food system requires more energy, land, and water resources than the lactoovovegetarian diet. In this limited sense, the lactoovovegetarian diet is more sustainable than the average American meat-based diet. Food demand influences agricultural production. Modern agricultural practices have resulted in polluted soil, air, and water; eroded soil; dependence on imported oil; and loss of biodiversity. The goal of this research was to compare the environmental effect of a vegetarian and nonvegetarian diet in California in terms of agricultural production inputs, including pesticides and fertilizers, water, and energy used to produce commodities. The working assumption was that a greater number and amount of inputs were associated with a greater environmental effect. The literature supported this notion. To accomplish this goal, dietary preferences were quantified with the Adventist Health Study, and California state agricultural data were collected and applied to state commodity production statistics. These data were used to calculate different dietary consumption patterns and indexes to compare the environmental effect associated with dietary preference. Results show that, for the combined differential production of 11 food items for which consumption differs among vegetarians and nonvegetarians, the nonvegetarian diet required 2.9 times more water, 2.5 times more primary energy, 13 times more fertilizer, and 1.4 times more pesticides than did the vegetarian diet. The greatest contribution to the differences came from the consumption of beef in the diet. We found that a nonvegetarian diet exacts a higher cost on the environment relative to a vegetarian diet. From an environmental perspective, what a person chooses to eat makes a difference. This is the Chicago paper PETA is referring to. 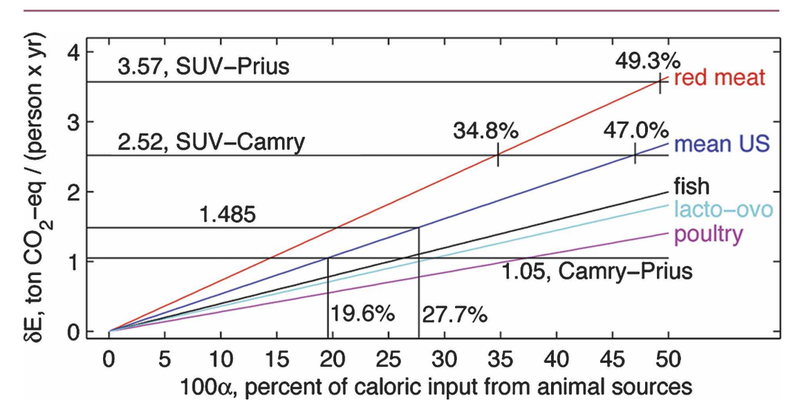 I should add that the values in this graph are normalized by the carbon footprint of a vegan diet, so a vegan diet does not produce no CO2 emissions as you might believe from the y-intercept of this graph. Not the answer you're looking for? Browse other questions tagged environment vegetarianism meat . Would avoiding the eating of meat stop global warming? Do vegan diets have lower environmental impact? Is it more environmentally friendly to stir hot drinks with pasta?